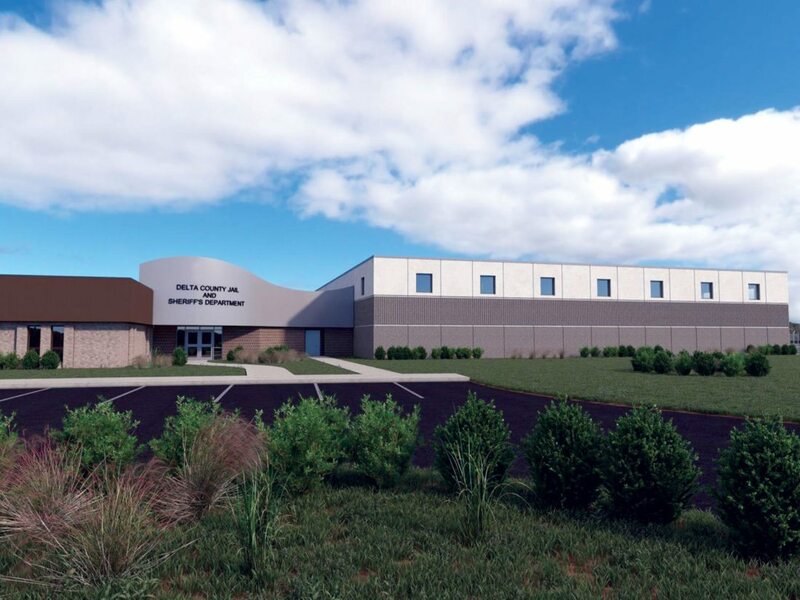 ESCANABA — Final construction plans for the Delta County Sheriff’s Department’s new complex were presented at Escanaba City Hall on Wednesday when a ribbon-cutting ceremony was also announced for Sept. 19. Delta County Administrator Ryan Bergman and Delta County Sheriff Ed Oswald gave an update on the $17.9 million project during the monthly meeting of the Delta County Joint Governmental Board, a group made up of officials from participating municipalities. Attending for the first time was Patrick Jordan, Escanaba’s new city manager, who chaired the meeting, welcoming township supervisors, county commissioners, and other city and county officials in attendance. Following introductions, Oswald talked about the long-time need for the new jail and the millage voters approved last November to fund the state-of-the-art facility. The project includes both new construction and renovation of part of the existing county services center at 2920 College Ave.
Oswald presented the latest architectural renderings of the interior and exterior of the new sheriff’s department. The two-story jail will house 160 beds compared to the 85 beds in the current facility which no longer meets the needs of corrections personnel and inmates. Half of the new sheriff’s department will be renovated office space previously occupied by Pathways, which is now located downtown in the state building across from the county courthouse. Renovations will create road patrol and administration offices, part of the booking place, storage area, and support services space. The other half of the new sheriff’s complex will be new construction consisting of the jail pod, a major portion of the booking area, a public entrance, and additional space for other purposes, explained the sheriff. Bergman presented updates on the site work now underway and the construction schedule. A large wooded area on the north side of the 13.63-acre site was harvested, he explained, showing aerial photographs of the land before and after trees were cut down. He also explained the bid process that includes foundation and site work recently awarded to various companies. The construction bid package will be released next week with bid opening scheduled for Oct. 10, he said. Construction of the new facility, as well as new holding cells at the courthouse, is expected to be completed by the end of 2018, said Bergman, noting employees will be familiarized with the new building for a time period prior to transferring inmates there. Bergman also gave an update on an application the county is finalizing for a U.S. Department of Agriculture loan which would reduce bond costs and interest rates on the project. In response to questions from officials attending Wednesday’s meeting, Bergman said current services will remain in part of the county services building. This includes Michigan Works!, Public Health Delta and Menominee Counties, Michigan State University Extension Services, and the Central Upper Peninsula Planning and Development Regional Commission (CUPPAD). He also said discussion continues to take place on what to do with the current jail property once it is vacated. Escanaba city and Delta County officials plan to consider proposals to redevelop the county’s current jail property and adjoining city-owned property along the lakeshore.